Vicaretti Dental Care provides the Greater Rochester area with quality dental care they can trust to achieve a healthy smile. 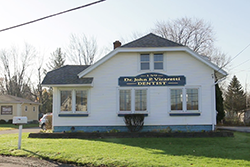 For caring dentistry you can count on and trust for the whole family, make an appointment with Dr. Vicaretti or Dr. Marino at Vicaretti Dental Care in Rochester, NY today. From dental cleanings and teeth whitening to veneers and dental implants, our dentists will put you on the path to a healthier, more confident smile. If you have any questions or concerns, call our office at 585-429-6943, or fill out the information below and a member of our team will get in contact with you as soon as possible. Thank you!